Over the last few years we have become very interested in the biogenesis of the mitochondrial ribosomes. The process is complicated by the fact that the two mitoribosomal RNAs (rRNAs) are universally mitochondrion-encoded whereas all ribosomal proteins (with a single exception in yeast) are encoded in the nuclear DNA. Its biomedical importance is highlighted by the fact that mutations affecting genes encoding mitochondrial ribosomal subunits are responsible for infantile multisystemic mitochondrial diseases, frequently involving encephalomyopathy and hypertrophic cardiomyopathy. Despite their biological and biomedical relevance, the knowledge on the molecular details of the assembly pathway and the factors involved in the biogenesis of mitoribosomes is still very limited. 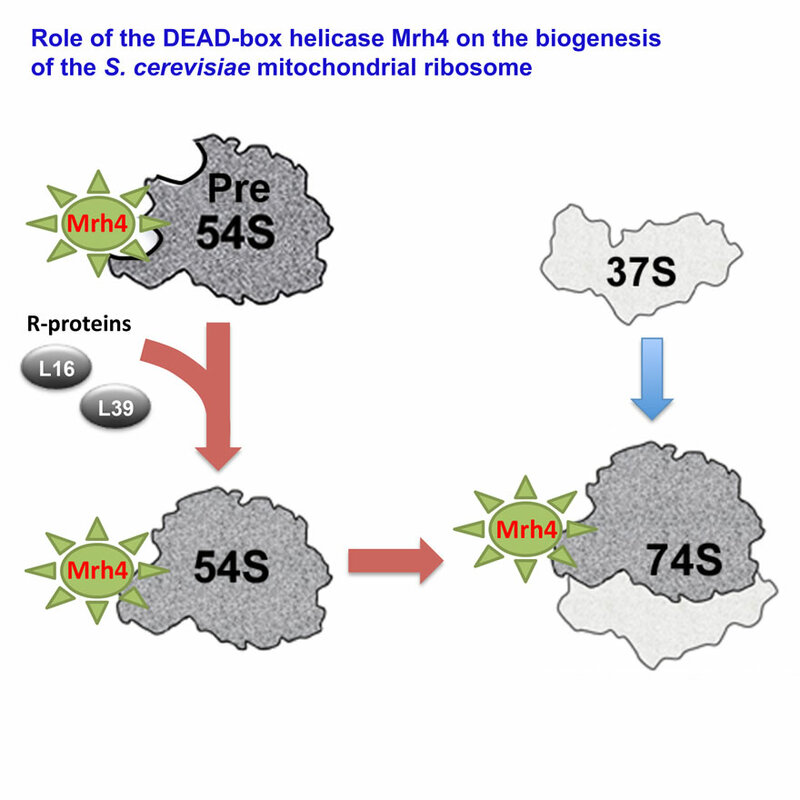 We have started searching for mitoribosome assembly factors and identified the first two DEAD-box helicases (Mrh4 in yeast and DDX28 human), involved in the process. 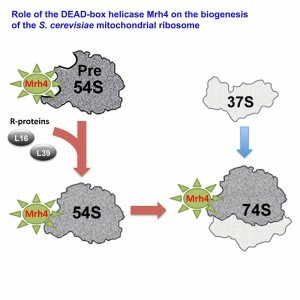 The work on Mrh4 was recently published in Cell Metabolism and the work on DDX28 is been revised for Cell Reports. Both proteins are essential during late stages of assembly of the large mitoribosomal subunit. In addition, human DDX28 is part of RNA granules, a compartment localized near the mitochondrial nucleoids, where we propose mitoribosome assembly largely occurs. Our ambitious goal is to precisely characterize the steps and factors involved in the yeast and human mitoribosome assembly pathway.